Have you caught the surfing bug, had a few lessons and decided to invest in a surfboard? Here are five of the best surfboards for beginners that you’ll find in Ireland. Before you are thinking about landing tricks, don’t run off and buy a fish or a tiny shortboard — you’ll get frustrated easily, suffer in the water and because they are not designed for whitewater, you’ll end up sacking it in before you really get to give it a go. Buy a decent foamboard or longboard and hammer down the basics before progressing, plus you’ll catch so many more waves on them! If you only surf a few times a year, our advice is to get a foamboard. If you think you’ll be in the water every few weeks, then get a longboard to future proof yourself. Consider weight and height — a good beginner surfboard has high buoyancy so you get away with more mistakes. An average adult should use an 8′, while a child can learn with a 6′. A rule of thumb is the bigger the board when you are starting off, the better. Surfers never forget their first surfboard so pay heed and get one of these. 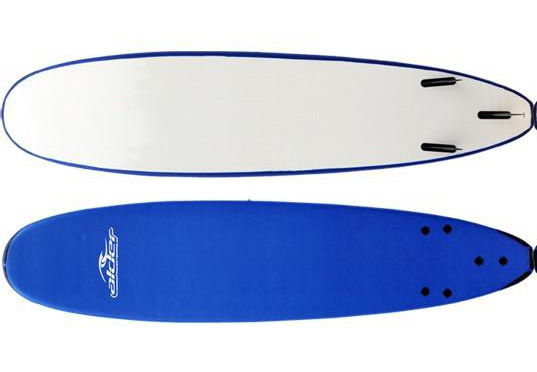 The Alder Softboard is the perfect board to learn to surf on. It’s very safe and durable with a high-density foam core and nose, tail bumpers, rubber fins and forgiving rails so you don’t get hurt. This surfboard was built specifically for buoyancy, so it floats atop the water easily — perfect for a beginning surfer who’s first priority is staying on afloat! It has a Tri-fin set up soft top and a hard bottom and is used by many surf schools to teach beginners the basics. This is a board that will allow you to learn quickly and effectively. This seven-foot softboard from the California Board Company (CBC) is a strong and solid purchase. It’s easy to paddle and manoeuvre, plus this Mini Mal looks a bit cooler than some of the foamies on the market! The board comes with a Tri-fin system as well as a surf leash. The 7-foot length allows for maximized balance and does not deter the surfer’s control of the board. Also, at €190, on the lower side of the beginner’s surfboard prices, this board is perfect for those who are just picking up the sport and are not sure if it will be something that they will want to continue or are unsure of how often they will be using it. This softcore board is wider and thicker than most of the others, which allows for better balance and stability. It’s a tough nut and will take a bashing from an Atlantic swell really well. Its soft plastic fins and soft deck are ideal for safety, so a beginner won’t have to worry about falling off the board and getting hurt. This board is available in sizes ranging from 6 to 9 feet, so, as surfers progress in their skill, they can simply reduce the size of a board that they may already be comfortable with instead of trying to find an entirely new version. A more subtly designed board for beginners, easier to carry, but still big and stable enough for beginners. This longboard has excellent dimensions — it is right in the middle of the desired lengths for beginners, allowing for a happy medium between stability and manoeuvrability. 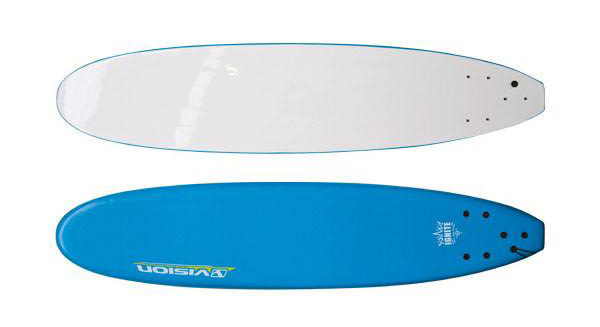 This board is durable enough to withstand harsh waves, and versitile enough to accommodate any surfer. It’s a good one if you know that you will one day make the transition to shorter boards and bigger waves. Here is another Mini Mal surfboard that is perfect for beginner or progression surfers that want to up their skills to the next level. The Southern is made with glass-fibre and epoxy resin and has a gloss finish and it looks pretty stylish. This board is suitable for waves between 2 and 6 feet — so nothing a too intense for a beginner! If you are surfing for first time, then you have to choose surfboards carefully because it all depends upon your surfboards when you surf the water surfboards plays the vital role. If your weight and height is heavy and tall you should choose heavy boards so that it is easy to surf.